There are so many miracles taking place in my life. 1. I was just hired by a professional school portrait photography business. (This offer helped me get off of Government financial assistance). 2. My third eye is opening. I have been diligent about joining in to do GraceLight at 10:30PM. My family is understanding, however some strange circumstances (forces) present themselves. Most times I am able to persevere. However, there are times I succumb to what is happening, but never losing the deep hope and love that is in my heart. The "strange forces" are part of my journey. I know I am loved and I AM LOVE. WE ALL ARE. Since I have participated in the GraceLight opening of the Gates, my mind, heart, eyes, and being have awakened. The Power of the Light is Magnanimous. It is pure beauty. My desire is to serve in the highest order with love and gratitude. My gratitude is toward the cycle of experiences that allows spiritual growth. I was truly blessed with the relationship of my husband who was such a loving Being. Both in our second marriage, we were also blessed with...yours, mine and my husband desired "OURS" children. His three and my one, what was he thinking??? Having a child wasn't even an option, but none the less, for several years he never let it go. He would say, I want a baby girl, I know she will look just like you, blond hair, blue eyes. Can't happen!!! Well, a girl was born, (my son's first child) and she was a gift. Black hair, brown eyes, exactly what I always wanted! Just after her first birthday, my husband informs me that I had not been very sharing with her so the next baby is his. Sure enough, soon after there was another baby girl...blond hair, blue eyes and in fact looked just like me! He was so happy! Most of the time both girls were with us and if they went home, two hours later he would go get them! I'll tell you, he fed, changed diapers, everything including every night he rocked her to sleep, even the night he made his transition. I really believe he was in touch with his Goddess energy! I know as much as he loved us, in my heart of hearts, he is joyful that his girls are in the Divine Light of Creator. Having been with Dr. Pillai (Baba), Julie and Jenny "know" their Pop Pop is not in the cold ground. Grace Light has taken the fear, pain, unknowing and dogma, replacing it with the truth that we never really die, we are Light, we are Love. The girls did not go into tears and sadness this Thanksgiving. I am grateful to Dr. Pillai for all the blessings." Love and Grace Light ~ R.
"Miracle's of the Grace Light"
I'd like to share with you a miracle I had today. It's 2 in the morning and I'm lying on my back in a dark room. Suddenly I feel very afraid for no reason since I usually like darkness. I try to think of something else but whatever I think of the fear would come back even stronger. So I decide to meditate on the origin of fear. As I do so I hear an inner voice slowly saying the word 'fear' and this time I'm really terrified. But immediately, a very bright rhombus-shaped white light flashes on the ceiling of my room out of nowhere. A few seconds later I find myself unconsciously remembering the mantra 'thiru neela kantam' which makes me feel peaceful. Finally I turn on the light and I manage to sleep. I have a dream in which I see my deceased grandfather wearing blue clothes in front of his old home. He was no longer paralyzed and then he went away in a black train to a destination unknown. Then I see a woman's face and I wake up. The same day at work, a person who used to hate me demonstrates to me unbelievable love and care, here I think "that's a miracle" and I see the same woman's face from my dream. The Grace Light is really true. I have no more doubt now! I've shared Grace Light with several friends and each time it has been such a lovely experience. It's so powerful. When I first began practicing with the streaming online practice room that features the GraceLight meditation call. There was one particular morning when I gave the Light to a friend remotely. I didn't know it at the time, but she was doing the same thing and giving to me. It was as if she was standing right in front of me giving me a great big hug her energy was so intense. My friend's experience was that we were jumping up and down, and joking about who loved (Baba) more. Recently I completed the final 5 gates with another friend. It's hard to find words to explain the experience. So beautiful. So amazing. My friend said she felt "full". After the session was over, we kept looking at each other and just kept bursting out in laughter. The only way I can explain it is I AM BLISSED OUT!!! Miracles do happen. Every single day. They just keep coming. I am filled with joy. My life is fulfilling and I am ever so humbled and forever grateful to Dr. Pillai. 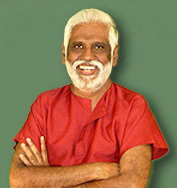 We 'met' Dr. Pillai on You Tube back in July of '08 and went for the first Grace Light seminar in August. My first miracle happened the very next day. My coffee intake went from a whopping 8 cups to one cup with no withdrawal headaches or changes in my mood. I've tried so many times before this to cut back or quit, to no avail. This time I wasn't even trying and it happened so effortlessly. In September we were traveling from PA to Michigan by car and we stopped to get a bite to eat at a service station. When we got back on the road, I started playing the Dancing with Siva CD. We were under an overpass when we heard a loud noise that we thought came from the train going above us. Our car started shuddering and we could see gray smoke coming from the back of the car. Luckily, we were still on the slow lane, so my husband managed to pull over to the side. We got out and saw that our rear tire was shredded and the rim was bent. Just then a car pulled up ahead of us and a young man came running towards us. He said he noticed one of our tires needed air and was trying to get our attention when he saw the tire blow out. Without being asked he tried to remove the bad tire. My husband couldn't help because of an old injury in his right wrist. While the good Samaritan was struggling with the tire, the Ohio Turnpike emergency truck came by and with the power tools on board, got the spare tire on in no time and we were on our way within 20 minutes. We truly believe Dr. Pillai saved us from death that day and sent us a few angels to help us as well. On New Year's Eve we went to NY to start the year with Dr. Pillai. We started chanting the new mantras and cutting nine lemons the very next day. So many miracles started happening that even after 45 days we've continued with the practice. ""Beautiful Sparkling Divine Ones, The puzzle is finally coming together, and the pieces are fitting. I never thought that I would be able to say that. My life had been filled with constant struggle; financial dilemmas, drama, emotional pain, frustration and confusion. So as a light worker, I have always known that the light is within me and I am guided to share it with others. Something I have done for years, not realizing that I did not stop to fill my own cup of love before filling everyone else’s. Since last year, after searching and seeking, I saw that I was not open to receiving my greatest good. So began this intense work, learning to fill my reservoir of love...accepting blessings from others instead of overextending myself. Through this journey, I was gifted a you tube of Dr. Pillai and there it all began. I was fascinated by this beautiful soul. I watched one you tube after another and shared his information with others. I was guided to be the event coordinator for "The Grace Light Intensive" here in Naples, Florida, in September2007 and the fun really started. I saw this idea manifest into 100 people attending this event. I knew at that point anything was possible. Then came the real test......I was having a conversation with my spiritual mentor and he shared all kinds of wonderful things with me. We spoke about India and Dr. Pillai's birthday. Suddenly, I felt this magnet pulling me. I was being called to India. Me??? India??? Yes, India, for my re-birth-day; that is what I called my birthday this year. I knew that I was being called to India. In that miraculous moment, on that call, the decision was made. I was going to India. May I say that everyone I knew thought I had truly lost my mind. How ..you have no money, no passport, no visa, you need shots, and blah, blah, blah....leave it to the universe, Dr. Pillai will take care of me. I said I am going.......watch it happen. Then I kept seeing myself on that plane. And then I WAS on that plane! I knew Dr. Pillai (Baba) was guiding me all the way. I could feel Lord Ganesh around me as I was always chanting through this wild ride. I was even chanting the Tripura samhara mantra to keep me strong as the little surprises were getting more and more intense. Finally I got on the plane with about $350.00 gifted to me to go to India. Throughout India, I was blessed. Gifts came from everywhere, from friendships, love, nurturing, money, to actual beautiful gifts from Dr. Pillai and my companions. I missed a bus, misplaced my passport, 2 massive thorns went through two pairs of shoes and not my foot, and all kinds of karma clearing fun things happened to me. ALL IN ALL THROUGH EVERY MOMENT ..I HAD UNWAVERING FAITH...and that is what was tested through this whole trip....and I passed the test. When I got home, checks were waiting for me that had been told to me they would take weeks to arrive. Clients have been emailing and calling for appointments and on and on. Karma is clearing all around me; from letting go of three pairs of shoes, to getting a new computer to buying new dishes. I am watching miracles and magic. I owe this to Dr. Pillai, I am so grateful for my beautiful journey and for the infinite joy that radiates from my every pore. My beloved teacher has changed my life and my destiny forever. I have been shown the Light of God, and have been guided home. I am an ever grateful and gracious receiver. ""If at all possible, the best thing for you to do would be to purchase the 2 DVD/ 1 CD set from the www.thegracelight. com website or from the www.PillaiCenter.com website. I say this because its cost is WELL worth it! Once you have it you can share the Grace Light with others - pay it forward - which is where you will experience the most rewarding experiences. All you have to do is be the facilitator and be in a place that you have access to a DVD player. Then you just push play - the videos do all the rest for you. That way you will also have the CD, which walks you through a Daily Grace Light Meditation Practice and you can use it over and over for a daily Grace Light practice! Believe me, it will be one of the best monies you have ever spent! Sharing it with others is so much better than keeping it for ourselves. And you will begin to find souls of "like mind" where you live also which cannot be anything but a positive right? ""Thank you. I just received a reply from (V.C.). the man in Italy. He said that at this moment he surely needs our prayers and he would like to meet up with our Grace Light group in Italy. I will continue to reply to Vincezo directly from now on, and I will call him when I am in Italy to invite him for the Grace Light Gathering both in English and Italian. Also I have facilitated a couple of times with the DVD the Grace Light in Reggio Emilia, Italy in my home. ""All I can say that it was a very powerful experience especially to myself. The Grace Light was strong inside of me which makes sense so I was able to share that with the group and one person said that he really felt it in his heart. I almost blissed out while sharing it. I can’t wait to do it again but unfortunately I don’t have the time to share in groups very often but I am hoping to be able to do it again in the near future. I keep myself charged with it every day by starting my day with the Grace Light meditation. "I just wanted to submit a short testimonial about the positive shifts in my life since I started working with the Grace Light Prayer Call late last year. I had been floundering financially for quite some time after a challenging divorce, loss of a business, and good length of time of under- and/or unemployment. Within a couple of weeks of starting to participate in the weekly prayer call, I saw good employment opportunities opening up for me for the first time after many months of no responses to my job inquiries. In late November I landed a good position at a wonderful company. I am now working with kind people who appreciate the skills I have to offer to the company. I have not been so pleased with a job in many years and I am confident that this wonderful opportunity is the direct result of working with the Grace Light to rebalance my energy in a way that I could fit into a lovely group such as the one at my new company. I also was on the verge of losing my home to foreclosure as a result of my financial downturn. Again, after only a short time praying on the Grace Light Call, my bank suddenly was willing to renegotiate my loan so that I can maintain stability for my children and me. I am eternally grateful to Dr. Pillai and the entire Grace Light Community for their prayers, love and support. It has been a beautiful part of my weekend routine to spend time in prayer and meditation with people who seek good things for everyone in the world. "My heart was struck with genuine warmth and compassion. I could literally feel nothing besides the outpouring of Divine love - giving and receiving with my partner(s). Full force was this ecstatic love radiating beyond the physical form into the infinite space. I was immediately transported into such blissful feelings – timeless – free of all boundaries and limitations - mentally, spiritually and physically – in the highest light of consciousness and intention. I never conceived that I could be part of so much healing love – so stimulating - so powerful - so pure – washing over everyone in that room. "I feel more at peace within myself and am more hopeful than I have ever been in my life. I am grateful for Dr. Pillai's Grace and His teachings. The biggest miracle is in knowing that Dr. Pillai is always there - silently protecting me, guiding me, Blessing me and surrounding me with His precious Divine Light and Love.